Gangneung Station Guest House is the nearest guest house to Gangneung Station. As it is located in the city center and almost all buses pass nearby, it is the optimal place to stay for tourists in Gangneung. First, it is situated around the Jeongdongjin shuttle bus stop and the bus stop to to Gangneung from which tourists can take a ferry to get to Ulleungdo Island. Guests can also easily reach the nearby bus stop for various bus services to Gangneung’s main tourist attractions including Gyeongpodae Pavilion and Sogeumgang Valley. Moreover, the free shuttle bus stop to Yongpyong Resort and Phoenix Pyeongchang, two of the venues of the 2018 Pyeongchang Winter Olympic Games, is also adjacent to the guest house. Offering guests relaxation amid a quiet and pleasant atmosphere, Gangneung Station Guest House is the ideal place to enjoy peaceful music with tea and coffee. It also offers a breakfast of hot rice and soup. Located on the hills to observer Cheongbo beach, the Grumpy house is as beautiful as the house in fairy tales. There are as many as fourteen units of beautiful houses with yellow rooftops on white walls. It makes you feel like being in the village once told of in a fairly tale. Each room is named after white snow princess or dwarfs. Every guest room is a standalone type. Inside, it is also very pretty and clean. Dual floor structure, cozy decorations, clean rest rooms, modern kitchens are the main factors for high satisfactions among visitors. The walkaway leading from the Grumpy house to the nearby forests is very easy to walk on. The scenic view of sea from the grass garden which is very well managed is also stunning. When making a reservation, you can get kids tents, sea mud field try tools rental, sea fishing tools. Also available are ATV-survival game discounts, Anmyoendo Jurassic park discount(20%), drip coffee from the café. It is very close to Choengpodae beach, Dalsanpo, Mongsanpo, Cheongsan plantation, Mageompo, nature world, Anmyoendo Jurassic park, Shrimp and crab bridges. It is about 25 minutes to Gotji beach of Anmyeondo and 30 minutes to Manripo beach. Chowon Resortel is an economical lodging located at the entrance of Mt. Seoraksan National Park, which is good for small-scale group tours such as family travels, school trips, and trainings. The rooms are composed of no-frills single room, condo-style single room, and a condo-style room with a living room. The rooms are maintained well. You will have a better impression of the place after meeting the owner who always greets guests kindly with a big smile. The resortel is well-known for its cost-effectiveness; BBQ set-up, for instance, can be arranged at affordable prices. The best merit of Chowon Resortel is the picturesque Mt. Seoraksan. You will feel that your body is relaxed just by looking at the natural background with its splendid mountain, rock peaks, pine forest, and valleys. You can get to the information center of Mt. Seoraksan in just a few minutes’ walk. From the information center, it takes 10 minutes to Sinheungsa Temple and about 1 hour and 10 minutes to the Rocking Stone. You can take the cable car to go up to the Gwongeunseong Fortress and walk 10 minutes to get to Bonghwadae which is the peak of Gwongeunseong. After visiting Mt. Seoraksan, you can move to the seaside where Sokcho Beach, Naksansa Temple, Daepohang, and Dongmyeonghang ports are located. Saudang Jongtaek (Head Family House) is located in Yundong Village in Seongju Gyeong sang buk –do, which is the concentrated village of Euiseong Kim Clan. Saudang is the old house enshrining Kim Yong-Cho, the founding contributor of the Joseon Dynasty, and composed of 7 Korean style houses positioned on the hill in tiers. Entering the gate, you will be able to see various kinds of flowers and trees growing in a wide grass garden. There is a small vegetable garden on one side of the yard. Behind the vegetable garden is the platform for small and large pots containing sauces and condiments. The rooms are composed of 4 independent Korean style houses: Saudang, Joseondang, Etiquette Room, and Experience Room. The owner of the house provides free lessons on traditional culture and etiquette in the training center. Visitors can learn or experience traditional Korean etiquette, tea ceremony, the culture of classical scholars, and the traditional ceremonies in ordinary homes. Equipment for traditional plays such as Neolttwigi, Yutnori, Tuho, Jige (Korean A0frame), small gong, etc. are prepared free of charge. All visitors can taste complimentary traditional teas while listening to Gayageum music played by the wife of the eldest grandson of the head family. If you want a rest of body and mind, inquire about the meditation class prepared by the owners of the house. You can also enjoy comfortable walking and trekking in the Dullegil path, which has been constructed recently along the village trail and the lotus flower complex. Offering the best view in Wando, Parkhill Comfort Hotel (Parkhill) is located on a hill overlooking Wando Harbor and Judo Island. Behind the hotel stands Wando Tower, the landmark of Wando, making the night view as seen from the room even more fantastic. The tidy and modern rooms of Parkhill are categorized into two: sea view rooms and tower view rooms. When you book the sea view rooms, be sure to watch the wonderful sunrise on the Wando sea. On the other hand, guests in the tower view room can enjoy the view of Wando Tower, Dadohae Sunrise Park, Dongbangbong Peak, and monorail going up to Wando Tower. Choose to stay for one day in a sea view room and spend the next day in a tower view room to have an unforgettable family trip. In particular, just down Parkhill are Wando Harbor and Wando Ferry Terminal, making the trip to the passenger ship for Cheongsando or Jeju quite convenient. The Evergreen Forest of Judo Island and Beach Park on the beach in front of the hotel allow its guests to enjoy the wonderful nature of Wando Island to their hearts’ content. In addition, there are many great restaurants around Beach Park, and the abalone course is especially famous as abalones from Wando are known for their high quality. Seafood dishes such as raw fish, roasted fish, and seafood soup cooked with fresh seafood from the clean Wando sea will add to the pleasure of the trip. The Economy Hotel in Bupyeong, Incheon City, aims for the friendliness of a guesthouse and the cleanliness of a hotel. The hotel offers a comfortable stay for all types of guests including women, families, and business travelers at affordable prices. It also has easy access to public transportation as it takes only 5 minutes on foot from Galsan Station of Incheon Subway. Breakfast will be offered to guests free of charge. In addition, in the basement level are the table tennis room, cinema, fitness center, and business center for guests’ convenience and entertainment. In particular, the Sky Garden on the roof offers beautiful scenery of sunset and night view. The surrounding tourist destinations include China Town, Yeonan Pier, and Wolmido Island. The trip to Ganghwado Island is recommended for tourists. Chunujaegotaek is an architectural house from the late Joseon period built by Gwon Jin (1568 - 1620). He was the grandson of Gwon Ui, the 10th generation of Gwon Su Hong who, in turn, is the founder of Bokyagongpa. Chunu is the name of Chunu Gwongjin which means “spring rain comes.” Is it because of the name? When rain drops fall on the Chunujae house, the fragrance of the hanok becomes more evident. In the yard are different fruit trees, peepal trees, and chrysanthemums. In particular, the chrysanthemums planted in front of the stone wall are natives to Korea and have witnessed the history of the house. Every year, the chrysanthemum petals are collected for tea brewing and the branches are soaked to make alcohol. A small stream runs outside the house, which makes for a pleasant sound. Staying in the hanok makes life elegant, restful, and idyllic. Currently, Gwon Chang Yong and his wife, the heir of the family, are living in the main room of the main building, maintaining the house. Unwilling to send off guests without meals, they provide breakfast. There are seven rooms in total but accommodation is only allowed on 2-3 floors in summer. Traditional Korean paste making experience is also conducted by Mrs. Gwon. A group of 10 or more is required to make a reservation in advance. Experience program varies depending on the season. Chungju wild flowers and old house visit is a traditional Korean house village located near Chungju lake, Salmi-myeon, Chungju. Originally, it is an old house for Choi Eung Seong built late in Chosun dynasty. It was once about to be destroyed as the result of building Chungju dam, but it was fortunately moved to the current location. Now, various traditional events or performances are held, and also used as a house for one night stay. The owner sells wild flowers and operates a wild flower café, so it is finally named as Chungju wild flowers and old house visit. Around the garden with a well that actually operates, there are anchae, sarangchae and haengrangchae that together form the shape of square. In each building, there are rooms decorated nicely with old furniture, paintings and so on. You can also reserve a BBQ place. Outside the old house, there are lots of items that our ancestors used to use and behind the old house, great forests are located to come in harmony with the traditional house. In front of the parking lot, a half moon shaped pond is located and the old house, Hamwoljeong achieves a great harmony with it. Suanbo hot spring is within 10 minutes of driving from there. A must visit place for tourists in Jeonju, Ilrakdang Sarangchae is located in the middle of the traditional Korean house village of Jeonju. The very first of three enjoyments for noble man, as indicated by Menicus, the existence of parents and brothers with no troubles is what the place is named after. 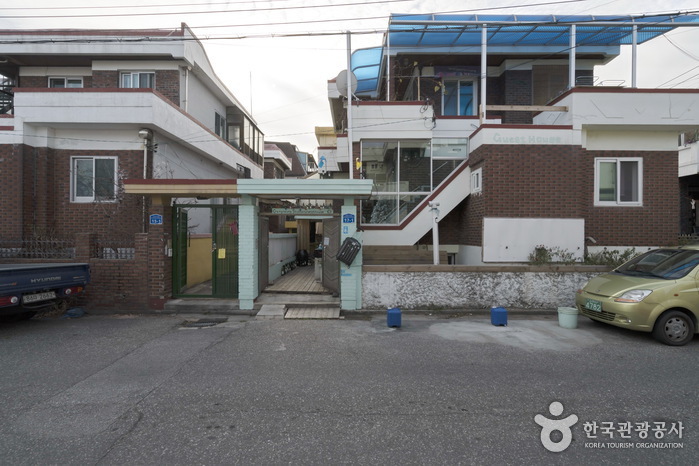 Standing in the garden, you can easily see the stone walls of Gyeonggijeon and also you are within the range of walking distance to Jeondong catholic church, Omokdae, Southern market, Jeonju Hyanggyo, and the wall painting village of Jaman. The rooms are called, Haengbokchae, Sarangbang, Mitum band, Monday, Tuesday, Wednesday, Thursday, Friday, Saturday, Sunday and so on. Haengbok room 1/2, a living room with furnace, a big sized attic above the living room are shared together, which makes it most suitable for big families or a small group of tourists. The Monday/Tuesday/Friday/Saturday/Sunday rooms all have a small, cozy attic and in every guest room’s wall, column and doors are mainly made of woods which makes them feel very warm. On every morning, in the shared kitchen, simple breakfasts mainly consisting of toasts, jams, coffee and juice are served. All guests are provided with discounts on Korean costume rental(30%), motor bikes(30%) and waengi bean sprout soup with rice (1000KRW). Besides, there are various services such as introduction to tasty restaurants in partnerships with traditional Korean house villages, as well as discounts, and try out of Korean rice cake making experiences and so on. Siwon is a Korean style guest house in Jeonju Hanok Village. The rooms in the guest house were named as All, Love, Health, Happy and Full to express the wish that ‘we could all live full of happiness sharing love and health’. There is an attic in every room except the Full Room to be able to play fun games. The guest house of Siwon is run by a native of this village who was born and grown here. The house is an earthen house topped with wooden roof tiles which cherishes the old memories of the owner of the house which had been called the ‘Persimmon House in the Ssangsiam Alley’. The traditional Korean style house had been built in 1954 and renovated in 2014 to accommodate travelers. The place was born again through the renovation to be soundproof and snug free from a draft while maintaining the unique beauty of the traditional house. A small flower garden is in the yard where people can play traditional folk games such as Tuho and Jegichagi. Siwon is within walking distance to Gyeonggijeon, the house which enshrines the portrait of King Taejo Yi Seongge of the Joseon Dynasty, Jeondong Catholic Church which reminds of the atmosphere of a European country, Omokdae Pavilion where King Yi Seongge held a party after conquering Japanese raiders, Jeonju Hyanggyo, Namcheongyo Bridge and Cheongnyeonnu as well as Nambu Market selling so many delicious foods and the Youth Mall. The Bogyeongsa Yeonsan Hot Spring Park is located under the Bogyeong Temple in the Naeyeonsan County Park in Pohang, Gyeongbook. There are a total of 27 guest rooms in the ground-level two-story building. There are two pension-type ondol types with cooking facilities, and they are composed of an ondol room, a bedroom, and a special room. The pension-type ondol room is equipped with cooking facilities, microwave ovens, and sofas. Guests who use other rooms may use the microwave provided in the corridor of each floor. All rooms have bathrooms with toilets, and bathtubs have been installed in special rooms. The outdoor garden has a barbecue area, which is available to all guests, and barbeque equipment can be rented for 20,000 won. As a complex lodging facility with hot springs, outdoor swimming pools, and snow sledding facilities near the area, guests can get a 50 percent discount on admission fees to all three venues. The discount percentage may vary, so it’s best to call before you visit. The Yeonsan Hot Spring is open all year round from 5:30 a.m. to 10 p.m., and boasts of pH 8.9 alkaline hot spring water, which is high in lithium. A city bus runs to the nearby Bogyeong Temple box office, allowing visitors to visit the place by public transportation. It is a good place to spend time with family as it has a pleasant and convenient accommodation and plenty of recreational facilities such as hot springs, water games, and snow sledding. Samllakheon is located in the center of Jeonju Hanok Village which is the highlight of traveling in Jeonju. Samllakheon has been opened newly by the owner husband and wife who are running Bugyeongdang, a lodging in traditional Korean style house. The building of Samllakheon used to be the etiquette training center of Jeollabuk-do Province, and its size is much larger and more magnificent than ordinary houses and its style is very antique. The arrangement of the houses, the pillars, rafters, crossbeam and the ridge of the roof are clearly different from those of ordinary houses. The garden covered with pebbles and rocks and the well-tended flower bed are also worth seeing. The rooms are composed of the five rooms of Spring, Summer, Fall, And, & Winter. Every room has a duplex attic under the high ceiling and a warm and clean restroom. The guests can help themselves with coffee, tea, toast, etc. for breakfast from the communal mini kitchen. The guests of Samllakheon can have 50% discount on Korean traditional clothes and 30% discount on rent of electric bike. It is also possible to experience traditional culture including making Injeolmi rice cake, Korean paper art, pottery and fragrant purse by making a reservation in advance. The owners of the house can give information on Jeonju Hanok Village, many other tourist attractions and famous restaurants in Jeonju area. Major tourist attractions within walking distance are Jeondong Catholic Church, Gyeonggijeon, Gyodong Art Center, Choi Myung-Hee Literature Center, Omokdae, Jeonju Hyanggyo, Pungnammun Gate nd Nambu Market & Youth Mall.